Kitchen Archives | Solved That! Clean Glass Top Stove – I spent most of my life cooking on a gas stove and when you have a gas stove you get used to precise temperature control and spilled food getting burned and stuck to the top of the stove. It’s a fact of life. Well as mentioned elsewhere we recently left my property manager life and apartment dwelling behind to live in a house in the suburbs. The house came furnished with all new appliances including a stove. That new convection oven an LG stainless steel electric with a black glass cook-top. I was kind of disappointed as I like cooking with natural gas but this new stove sure is pretty and that top must be so easy to clean with its smooth glass surface. Well that all went out the window when I made our first meal a stuffed chicken with gravy. Not used to the electric burners I boiled the gravy over and you guessed it, it stuck like cement to my nice new clean glass top stove. After the top cooled I figured no problem a wet sponge will make short work of this mess. I was wrong. My girl calls her mother for some advice. They both search the internet and social media. Their findings were all sorts of concoctions and chemicals from what we already had laying around. Some kind of worked but not easily. Then I got back involved and hit my favorite online retailer. Sure enough I found a bottle of magic called “STOVE TOP CLEANING CREAM“. It cost a little over $8 for a 20oz bottle, free shipping with Amazon prime. I promptly ordered a bottle and two days later it was in hand. My girl being a skeptic was off to the kitchen for a test. I think while she wanted it to work she didn’t want my solution to be the answer. You know because Im a guy and it could not be this easy. Well within seconds of application she was on the phone with her mother (go figure). 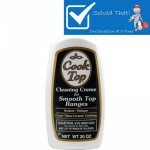 It seems the “STOVE TOP CLEANING CREAM” was indeed magic in a bottle. I bought mine here. Thank me later.